If you love kidlit as much as we do here at WriteOnCon, you’ve likely toyed with the idea of writing your own kidlit stories. Maybe you’ve even gone so far as to write or publish a book. But writing kidlit isn’t the only way you can love and support the industry. Today, let’s talk about five other ways you can share your joy of children’s literature with the world. 1. The 3 R’s: Read, Rate, Review! Chances are you’re already quite fond of reading kidlit, but do ever take the time to rate and review your favorite children’s books online? By rating and reviewing kidlit books in online marketplaces such as Amazon, Barnes & Noble, and iBooks, as well as on Goodreads — our favorite app for book lovers — you help those books gain further visibility. More visibility, in turn, means more book sales, more support for kidlit authors, and more kidlit books in the hands of young readers. 2. Be Loud, Be Proud. How often do you talk about your favorite kidlit books with fellow book lovers? Your words have influence. More than any promotion or advertisement, word-of-mouth hype is what helps books succeed. When you share your excitement for a new release or talk about why you love and recommend your latest kidlit read, you lend that book credence, encouraging other readers to get involved. So the next time you’re freaking out about an awesome kidlit book, consider telling a friend, posting a snap on Instagram, tweeting your recommendation to fellow book lovers on Twitter (make sure to utilize the #amreading hashtag! ), or finding another fun way to make sure the whole world knows how much you love kidlit. 3. Start a Book Club! Ready to take your love for children’s literature one step further? Why not start a kidlit book club? Decide when, where, and how often you’ll meet. Invite fellow kidlit lovers to join your book club. Choose your first book-club read. Can’t meet face to face? No worries. You can even start a virtual book club. Setting up a Facebook group, a Twitter chat, or a Google Hangout are all easy ways to connect and converse with your fellow book lovers. Simply follow the four steps above to get started today! 4. Foster KidLit Programs and Accessibility. It’s no secret that literature can educate, inspire, and expand readers’ minds, kidlit included. Unfortunately, children’s books aren’t widely available to all young readers around the globe, perhaps even those in your own backyard. Donate kidlit books to your local schools and libraries. Support local libraries and reading programs financially. Offer your time as a reading tutor. Set up a summer reading program or reading reward system for the children in your local community. Work with your local schools and libraries to host author events for children. Host a read-in (complete with pizza and pj’s!). Fill the night with read-alongs, book talks, and bookish games and prizes. Don’t be afraid to get creative! There’s no bad way to help foster a brand new generation of bookworms. 5. Promote Diversity Within Children’s Literature. Beyond a lack of access to literature, one of the biggest reasons children don’t read is because they struggle to see themselves in the stories available to them. The world is a melting pot, yet there remain so few children’s books that feature characters with diverse experiences and identities. It’s our job as readers to demand change, and our job as writers and industry professionals to help make this change a reality. A few easy ways you can help promote diversity within children’s literature? Simple; head back to the top of our article and love on diverse kidlit using the ideas we’ve already discussed. Actively seek out diverse books to read, then rate and review them online to help the authors behind diverse books succeed. Be loud and proud about your love for diverse stories by sharing them online and in-person. Include diverse stories in your book club picks, and help promote accessibility to diverse stories within your community. Every child deserves to see themselves in the stories they read. Who’s ready to help us here at WriteOnCon make this need a reality? All pumped up and ready to shout your love for kidlit from the rooftops? 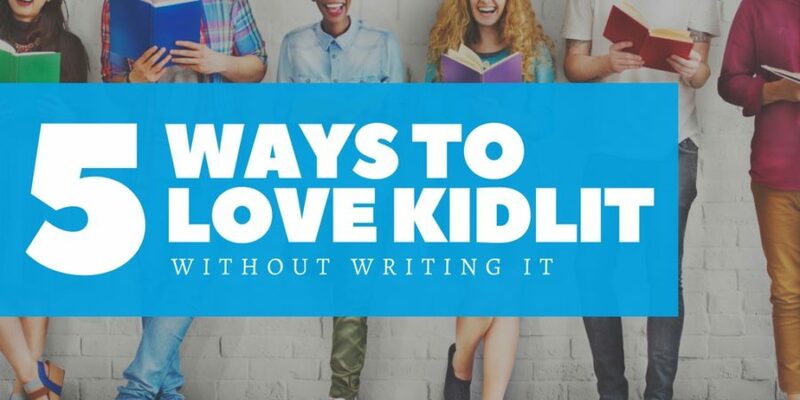 Share with us what steps you’ll take to begin loving on kidlit today in the comments below!